I wrote Monday night about this year’s baseball Hall of Fame candidates, in anticipation of yesterday’s announcement of the results. You can see the complete voting here. No surprises. 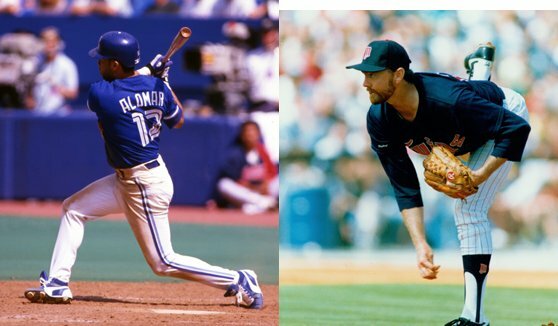 As was widely expected, Roberto Alomar and Bert Blyleven were inducted. That Alomar wasn’t elected last year, in his initial year of eligibility, never made sense, except in the context of the famous and uncharacteristic 1996 spitting incident. But how does Alomar go from 8 votes short of induction last year to getting about 90 votes more than needed this year? How do dozens of voters come to the conclusion in parallel that as one of the three or five greatest second basemen in history, he should be inducted as soon as possible, but not too soon, so let’s make him wait a year? Anyway, he’s in, as is Blyleven as the culmination of fourteen years of gradually building support. Alas, the two players I argued for the other night — Edgar Martinez in his second year on the ballot and Larry Walker in his first — didn’t come close. Edgar fell back a bit, named on just under a third of the ballots, a drop of a little more than 3%. Walker was named on only 20% of the ballots, not a promising start. Steroids aren’t an issue with either of them, but each has a fatal flaw: Edgar was a DH for most of his career; Walker played in Coors Field (a hitter’s paradise) during his greatest years. At the other extreme, former Mariner Bret Boone received one vote in his first (and last) year on the ballot. I think the overly strict standards being applied by many voters are inane. But this might just be even more inane. By what possible definition of Hall of Famer can Boone make the cut? As for applying overly strict standards, Joe Posnanski comments on the logical outcome in his latest piece, The Willie Mays Hall of Fame. I don’t want to spoil the punchline, so I won’t say more about it. I just wish we could focus on the baseball and not on so-called moral issues that voters somehow are presumed to have the ability to judge.